Discovery Channel will present the riveting story of IPL Team Kolkata Knight Riders’ transformation, from a group of struggling players in the early years to their emergence as formidable champion of the league in its new series Living With KKR. 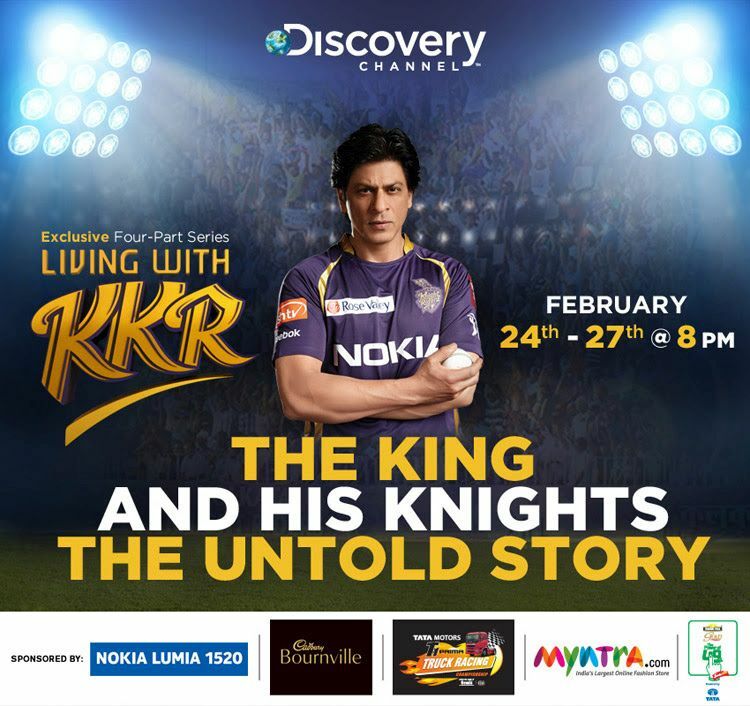 The Four-Part Series Living With KKR will air from February 24 to 27 at 8 pm on Discovery Channel. The series traces the emotional journey of the team from its unsuccessful first three years to its ultimate redemption as IPL champions. The viewers will witness candid admission by their favourite star Shah Rukh Khan – his worst fears, heart-rending moments and record celebrations. They will hear straight from Shah Rukh Khan the reasons for selecting Kolkata for his team, its arduous climb, the tears from constant defeats, adapting to new format and relationships that didn’t last. The series also brings to the fore the unseen role played by co-owners Juhi Chawla and Jay Mehta, the daring new decisions of its CEO Venky Mysore, the immense pressure absorbed by its captain Gautam Gambhir and the passion of the players, coaches and fans. In the series, Discovery Channel will also provide insights into the IPL phenomenon; the electrifying passion, poignant drama, astonishing opportunities and consummate glitz. “There are moments in our lives that we always want to have with us as a memory of that time. Living With KKR is exactly that for us. The journey that KKR has had since the beginning of IPL has been unique. I am glad that we have a story to tell and with the help of Discovery Channel we will share it with the world. Hope everyone enjoys watching it as much as we enjoyed being a part of this journey that continues.” – says Venky Mysore, CEO and MD, KKR. Living With KKR has been produced for Discovery Channel by Engage Sports Media.